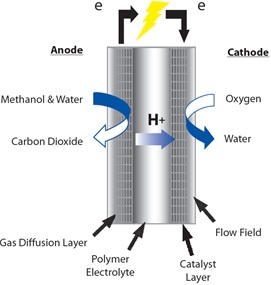 Unlike internal combustion engines that burn fuel for power, direct methanol fuel cells (DMFCs) use a polymer electrode membrane to convert chemical energy to electrical energy. Methanol fuel is delivered to the anode side of the membrane, where it is split into protons and electrons. The electrons pass to a circuit and create electrical current, while the protons pass thorough the membrane to the cathode side of the fuel cell. When the electrons are also delivered to the cathode side of the fuel cell, they reunite with the protons and oxygen to form carbon dioxide and water.